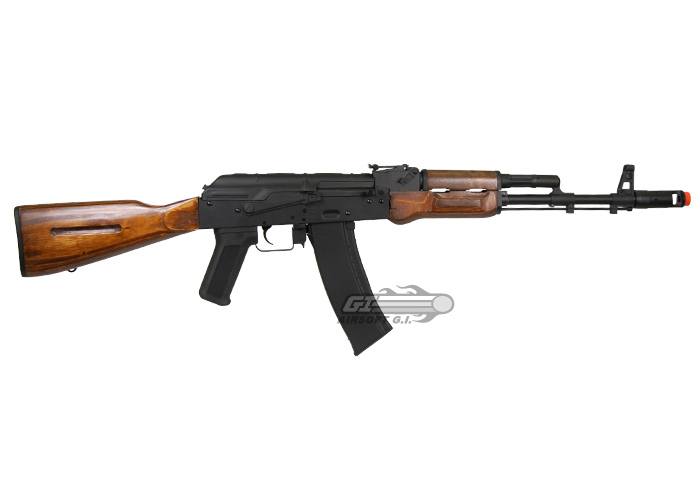 The CYMA CM048 Full Metal/Wood AKM is another great example of CYMA's range of AK style airsoft guns. 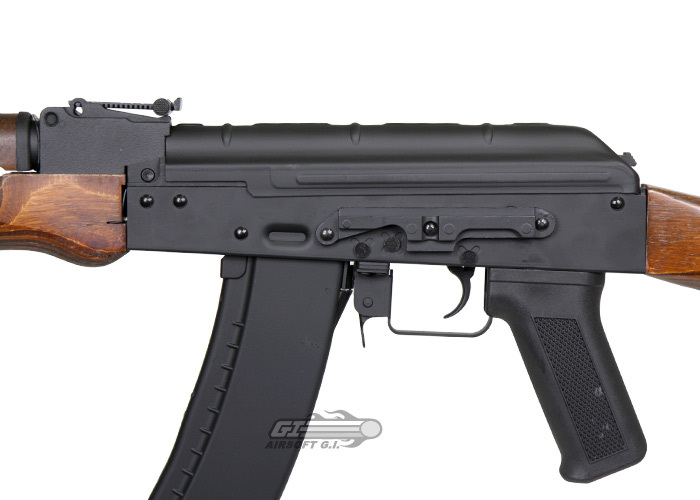 The CM048M features a wood handguard and fixed stock. 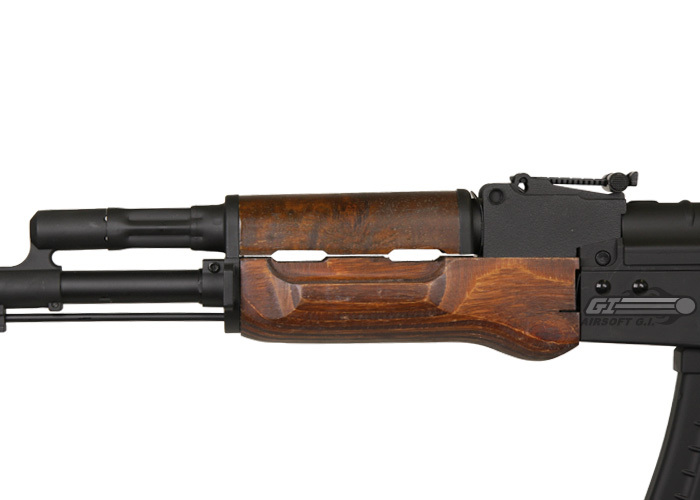 The body is sturdily constructed with metal parts including the receiver, receiver cover, barrel assembly, selector lever, trigger assembly, and the magazine catch. 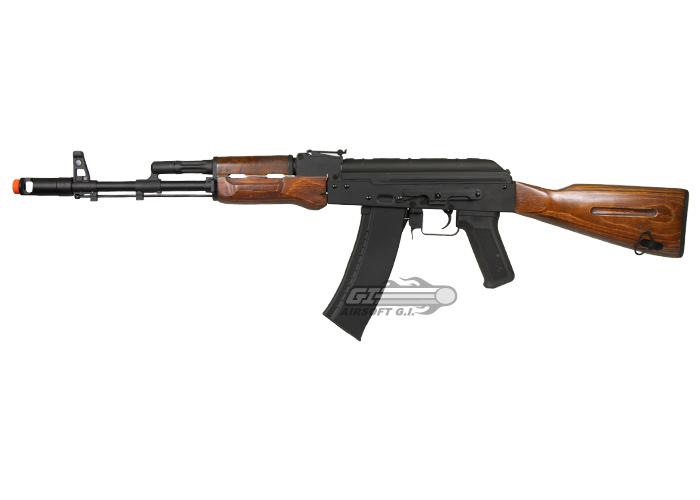 The AK has the advantage of a large stock that can hold a large battery pack and a high capacity magazine that can hold up to 600 rounds. 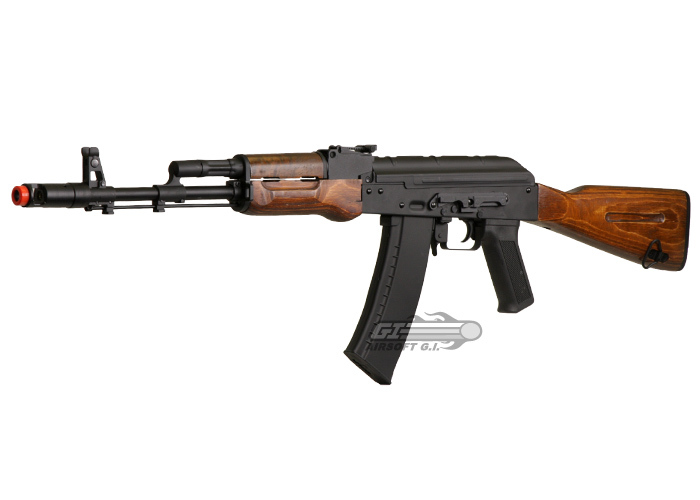 The AKM's additional features include sling attachment points, adjustable rear sight, and a AK accessory rail that the user can mount ak style accessories. I have been playing airsoft for about 6 years now, never have I felt a more solid gun. The build quality is better than my vfc scar l ($380). It weighs a pound under my real steel s&w ar-15, which my be a con for some. I bought this gun to do upgrades with and wanted a nice ak platform that was sturdy. It is somewhat easy to take apart. The gearbox is pretty nice, metal gears that seemed pretty nice, plastic piston and piston head, metal spring guide with ball bearings which are awesome. Overall the internals were pretty decent. Accuracy was great only 1.5 foot spread at 135 ft. 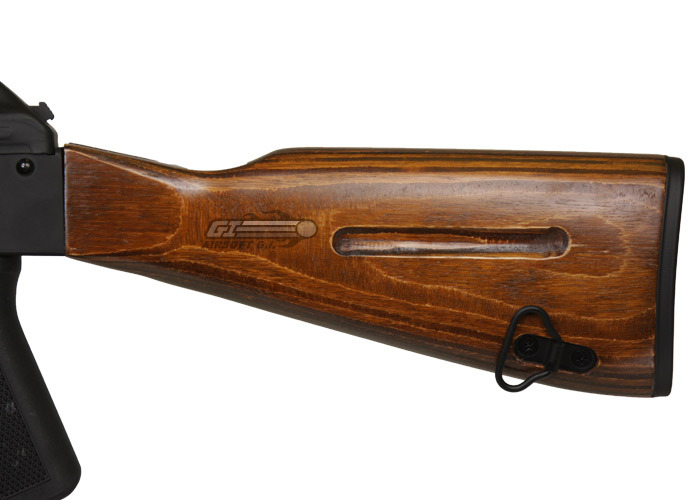 This gun is shooting to hot chronoed by asgi at 472. The metal receiver is steel along with the muzzle brake, gas tube trigger and trigger guard, barrel is some other metal. The wood has an excellent finish and I dropped it on accident with absolutely no scratches. The mag wobbles from side to side. Overall this gun is one of the best guns for the money and is modeled of the $400 dollar vfc version. Definitely buy this if you want to upgrade or starting off. This gun is simply stellar! Mine was consistently shooting 432-435 fps, perfect for my outdoor field in Massachusetts. It shoots straight for at least 40-50 yards. The BB's were even undeterred through brush! In the first two games I played it proved itself extremely viable in a firefight. I've had other AK's before, and all my old mags were compatible, which is very useful. -A bit heavy for long games, (9 Pounds) but I just use a sling. Got this quite a few years ago, still functions great without any modifications other than a newer battery. Both plastic magazines I got when I bought it broke, so buy some metal ones. Looks great. plastic mags will break, get metal ones. Is there a way to decrease or keep the fps at 400? My field has a strict fps rule of 400 fps. Is there a way to keep the fps at 400? 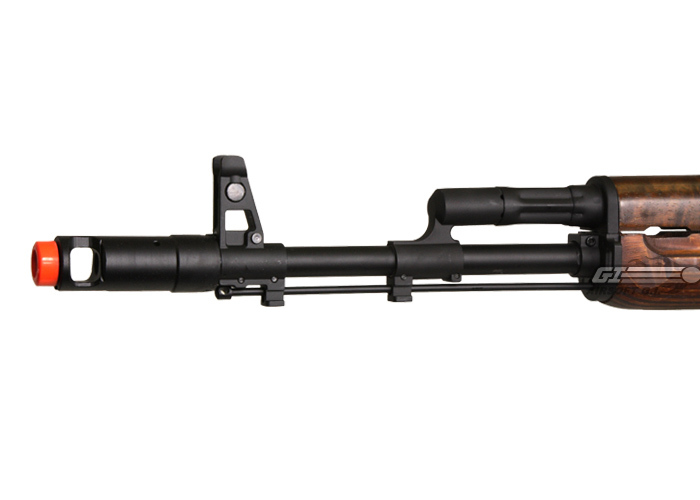 Like most airsoft guns, you can downgrade the spring to shoot at the FPS you are referring to. I recommend using a M110 spring. The airsoft gun will not break on you instantly. But like most airsoft guns, parts are bound to come apart because of normal use. There may be some wobble but that will be normal. Can I use this mag? That gun should have small type Tamiya connectors. This particular gun should have small type Tamiya connectors. 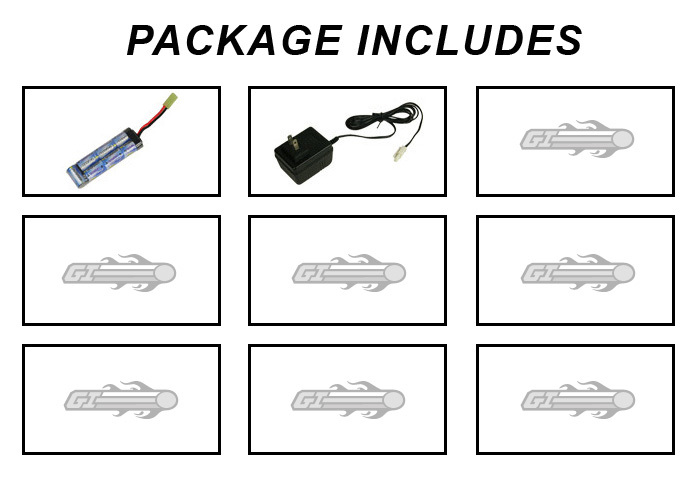 You will want a 9.6v Mini Battery, that should fit.